International response to the Psychiana movement exceeded the wildest expectations of most anyone in Moscow, Idaho. Even the movement’s founder and prophet, Frank Bruce Robinson, was surprised by the speed with which his new religion swept the globe. However, after decades of astonishing success, Psychiana Inc. would quickly and unexpectedly dissolve. 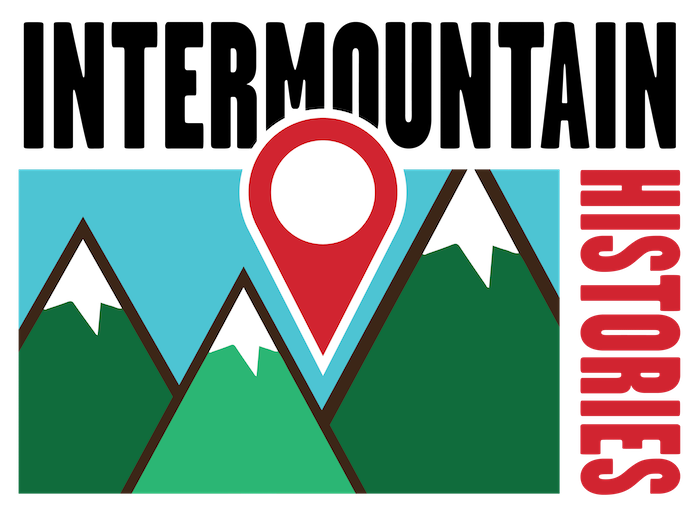 Consequently, the largest religious movement to be born in the Intermountain West maintains a complicated legacy. The Psychiana movement began in 1929 with a simple advertisement in Psychology magazine. 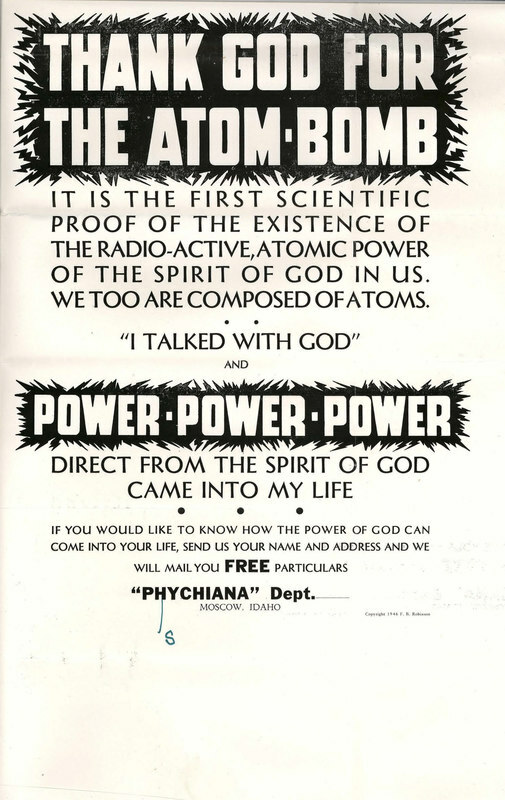 Promising to teach anyone to “literally and actually” speak to God, the ad was answered by an overwhelming barrage of letters requesting subscription to the new mail-order religion. Within two decades, Psychiana would be counted as the world’s seventh largest religion. Though largely forgotten today, Psychiana remains one of the largest and most consequential religious movements founded in the Intermountain West. 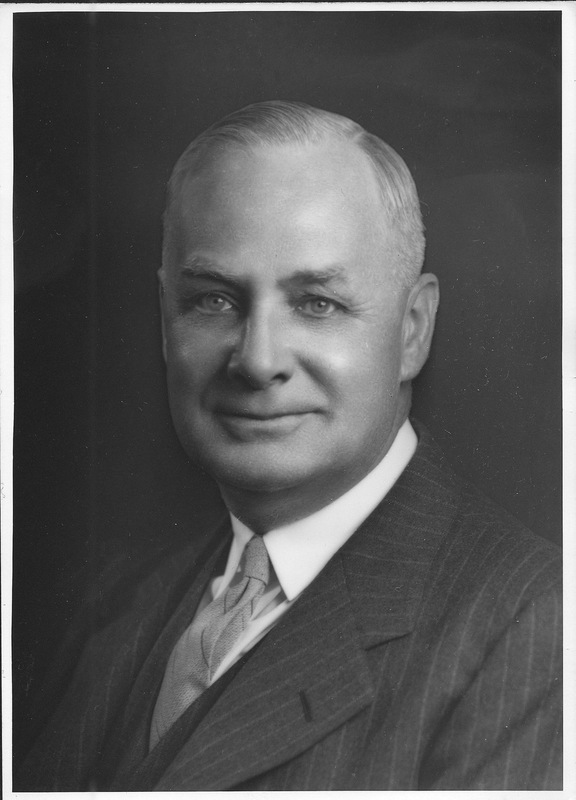 The religion’s founder and prophet, Frank Bruce Robinson, settled in Moscow, Idaho in 1928. Having left bible training college unsatisfied, Robinson tired of traditional Christianity and established himself as a druggist. As early as 1925, he began to record thoughts on a new religion that blended elements of Christianity and New Age spiritualism. After a short time in Moscow, Robinson began to host lectures preaching the power of positive thought. 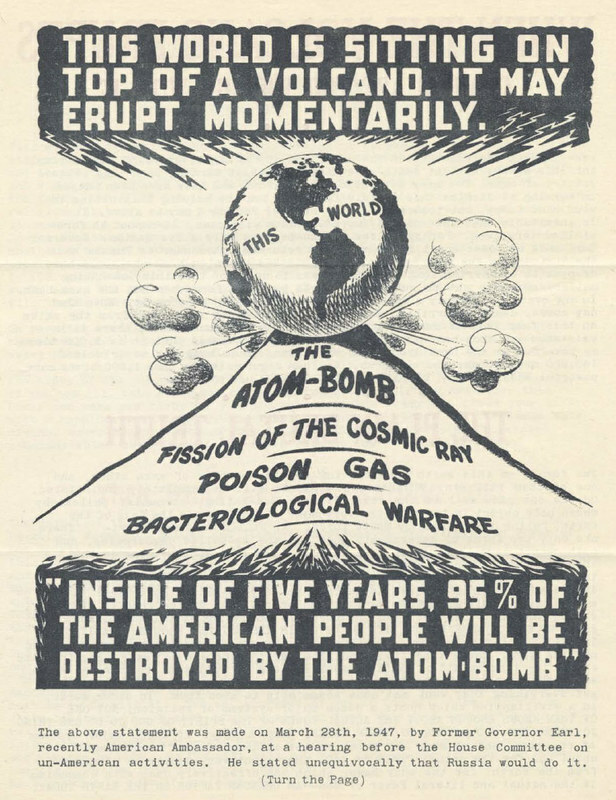 Urged by local followers, Robinson placed the fateful Psychology magazine advertisement that catapulted his movement into the international spotlight. The lessons of Psychiana were compiled into a series of lessons and mailed individually to the subscriber. In all, Robinson composed more than twenty lessons that could be collectively purchased for roughly twenty to forty dollars. In addition, Robinson offered his autobiography and a variety of self-help pamphlets for purchase. Soon after founding the religion, Robinson left the pharmacy business to manage Psychiana’s mammoth office headquarters. With more than one hundred employees, Robinson became the largest private employer in Latah County. 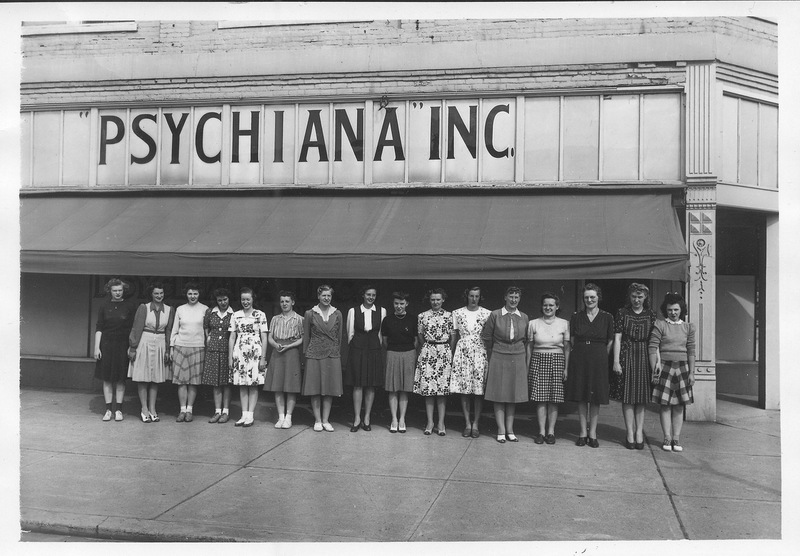 Psychiana garnered 36,000 subscribers in sixty-seven countries within its first year of operation. By the early 1930s, the Moscow post office sent and received more than 60,000 pieces of Psychiana correspondence each day. Eventually, they had to construct a larger post office. Robinson’s message of enlightenment and prosperity appealed broadly and worldwide economic misery and political anxiety only served to enlarge Psychiana’s audience. Letters poured in affirming the power of Robinson’s philosophy. Curiously, Benito Mussolini numbered among Robinson’s admirers and the two communicated regularly by telegram. Robinson’s business dramatically quickened as uncertainty from the global depression of the 1930s gave way to outright fear of a world war in the 1940s. Robinson went so far as to sell lapel pins that proclaimed Psychiana’s ability to defeat Adolf Hitler. By the end of the Second World War, Psychiana had rapidly and steadily grown for almost two decades. In 1948, Frank Bruce Robinson died of a heart attack at the age of sixty-two. The death of his movement would come soon after. Business declined after Robinson’s death, forcing his son to close Psychiana’s doors in 1952. As mysteriously as it had emerged onto the world’s stage, Psychiana disappeared into the void of discarded philosophies. Considered by many to be a passing New Age fad, Psychiana nonetheless altered the lives of countless people and occupies an important position in the history of the Intermountain West. Samuel Sharp, University of Idaho, “Psychiana: Prophesies from Moscow, Idaho,” Intermountain Histories, accessed April 19, 2019, https://www.intermountainhistories.org/items/show/110. Braden, Charles Samuel. These Also Believe: A Study of Modern American Cults & Minority Religious Movements. New York: Macmillan, 1970. Frank Bruce Robinson Papers, MG 101_b7_F31_ 018. Special Collections and Archives, University of Idaho Library, Moscow, ID. Frank Bruce Robinson Papers, MG 101_b7_F27_ 008. Special Collections and Archives, University of Idaho Library, Moscow, ID. Psychiana Publications, MG 5730. 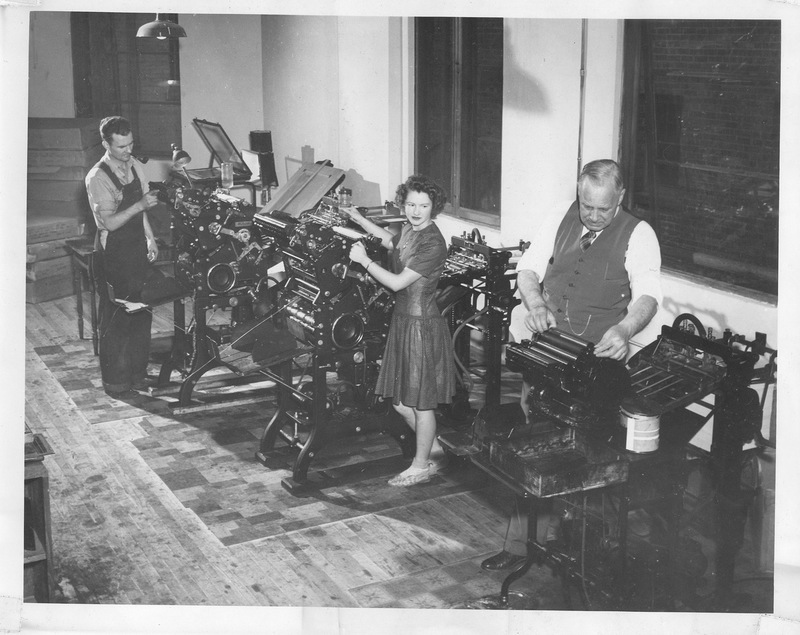 Special Collections and Archives, University of Idaho Library, Moscow, ID. Robinson, Frank B. The Strange Autobiography of Frank B. Robinson, Founder of "Psychiana". Moscow, ID., 1949.